RF|Binder was charged with developing a multifaceted campaign focused on Malaysian cuisine to stimulate interest in the country and its culture. Malaysia External Trade Development Corporation (MATRADE) is a government agency that aims to introduce Malaysian export products to the US. RF|Binder was hired as AOR last year and charged with developing a multifaceted campaign focused on Malaysian cuisine to stimulate interest in the country and its culture among consumers in the New York tri-state area. Numerous events helped educate media, consumers, and influencers. Media and influencer relations, social media outreach, a website, and ads also helped drive awareness. The campaign kicked off with a luncheon in March at the International Culinary Center. Media, bloggers, influential chefs, and Malaysia community celebrities attended. Atalanta Rafferty, RF|Binder's executive MD, notes journalists and bloggers covering food, metro news, entertainment, and culture were targeted throughout the campaign. Press trips to Malaysia in April and June allowed consumer and trade media to sample food in various regions. Chefs also made trips and attended classes at New York culinary institutions. A campaign website that includes information about events, restaurants, and recipes launched in April. A dedicated Twitter page launched in June. 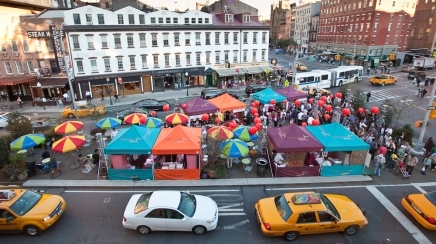 Events included two “Malaysian Night Markets” – one at the Lucky Rice Food Festival in Dumbo in April and another in Chelsea during Fashion Week in September – at which local Malaysian restaurants served signature dishes under colorful tents. For six weeks beginning October 11, a branded food truck traveled Manhattan and Queens, offering free food samples from more than 16 restaurants and free restaurant guides with reviews. Twitter was key to promoting the truck. A two-day tasting event in Grand Central station in early November included huge kite decorations, dance performances, and cooking demonstrations. The food truck distributed about 36,000 total samples. More than 25,000 consumers and about 70 media members and chefs attended the Grand Central event. Latiff says restaurants reported average sales increases of 25% during Malaysian Restaurant Week. The website attracted nearly 150,000 unique visitors (418,074 page views) for the year. Twitter followers increased from zero to 1,340 within four months (currently more than 1,500). Media impressions topped 113 million in outlets such as The Wall Street Journal, Food & Wine, The New York Times, and SeriousEats.com. Based on last year's success, Latiff says the campaign will continue with new elements promoting packaged foods.